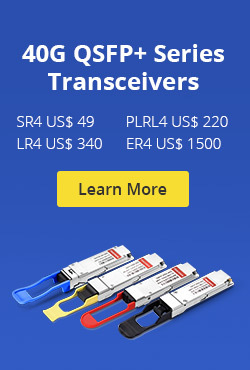 Wavelength Selective Couplers (or Splitters) are used to either combine or split light of different wavelengths with minimal loss. Light of two different wavelengths on different input fibers can be merged (combined) onto the same output fiber. In the reverse direction light of two different wavelengths on the same fiber can be split so that one wavelength goes to one output fiber and the other wavelength is output onto the other output fiber. The process can be performed with very little loss. As the coupling length is wavelength dependent, the shifting of power between the two parallel waveguides will take place at different places along the coupler for different wavelengths. All we need to do is choose the coupling length carefully and we can arrange for loss free wavelength combining or splitting. These functions are shown in the figure below. The graph of power transfer shows how power input on one of the fibers shifts back and forth between the two waveguides. The period of the shift is different for the two different wavelengths. Thus in the left-hand section of the diagram (combining wavelengths) there will be a place down the coupler where all of the light is in only one waveguide. If we make the coupler exactly this length then the signals have been combined. On the right-hand side of the diagram the reverse process is shown where two different wavelengths arrive on the same input fiber. At a particular point down the coupler the wavelengths will be in different waveguides so if we make this the coupling length then we have separated the wavelengths exactly. In fact both the processes described above are performed in the same coupler—the process is Bi-Directional (BiDi). Thus the coupler on the left can operate in the opposite direction and become a splitter and the splitter on the right can operate in the opposite direction and become a coupler (combiner). Note that each coupler or splitter must be designed for the particular wavelengths to be used. Commercial devices of this kind are commonly available and are very efficient. The quoted insertion loss is usually between 1.2 and 1.5 dB and the channel separation is quoted as better than 40 dB. “Wavelength flattened” couplers or splitters of this kind operate over quite a wide band of wavelengths. That is a given device may allow input over a range of wavelengths in the 1310 nm band up to 50 nm wide and a range of wavelengths in the 1550 nm band also up to 50 nm wide. On the left-hand side of the figure we see an example of coupling two different wavelengths into the same output fiber. At the input of an EDFA you want to mix the (low level) incoming signal light with (high level) light from the pump. Typically the signal light will be around 1550 nm and the pump will be 980 nm. 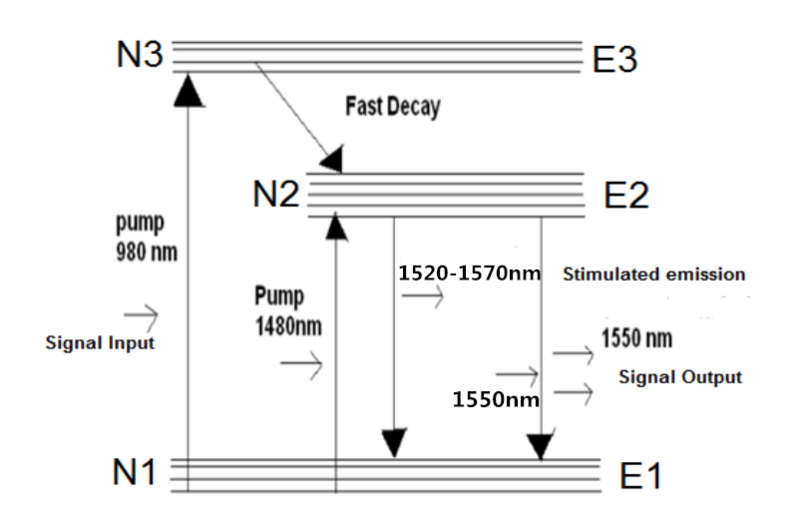 In this case it is possible to choose a coupling length such that 100% of the signal light and 100% of the pump light leaves on the same fiber. A major advantage of this is that there is very little loss of signal power in this process. On the right-hand side of the figure we show an example of CWDM demultiplexing. A mixed wavelength stream with one signal in each of the 1300 and 1550 nm bands is separated into its two component wavelengths. 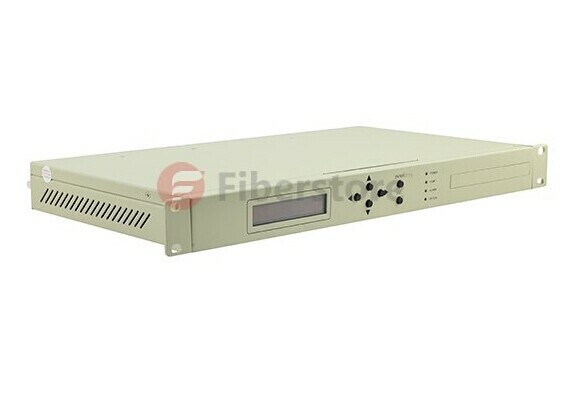 A CWDM system like this might be used in a system for distributing CATV and advanced VOD services to people in their homes. One signal stream might be carried at 1310 nm and the other at 1550 nm. A resonant coupler is shown here operating as a splitter separating the two wavelengths. Note that an identical splitter could also be used to combine the two wavelengths with very little loss. 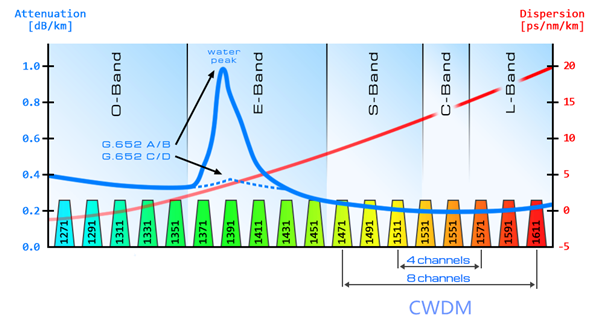 In DWDM systems where many channels are carried in the 1550 nm band there is often a requirement to carry an additional relatively slow rate channel for management purposes. 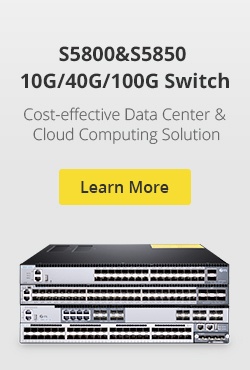 A convenient way to do this is to send the management information in the 1310 nm band and the mixed DWDM stream in the 1550 band. Wavelength selective couplers are commonly used for this purpose. A management signal (a single wavelength) in the 1310 band is coupled onto a fiber carrying many wavelengths between 1540 nm and 1560 nm. Another similar device (wavelength selective splitter) is used to separate the signals at the other end of the link. 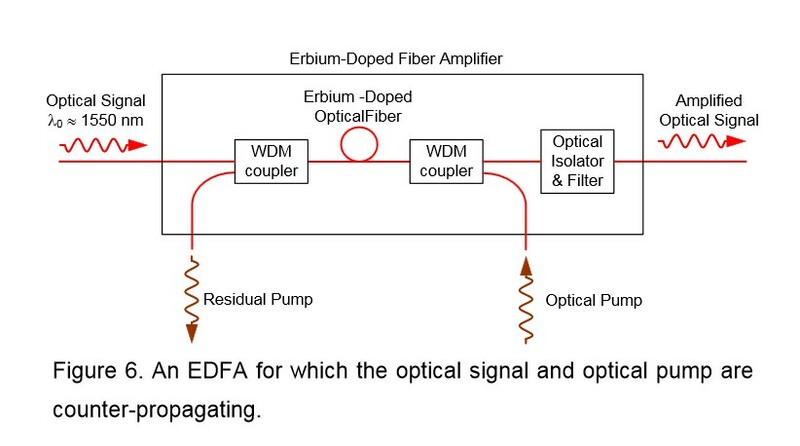 This entry was posted in Optical Splitter and tagged CWDM, CWDM demultiplexer, DWDM, DWDM demultiplexer, EDFA, wavelength selective coupler, wavelength selective splitter on March 5, 2015 by Amelia.Liu.